This section includes mountains, hills and valleys of the Transverse Ranges and the Peninsular Ranges that are near the Pacific Ocean, but not bordering it. Much of the section is close enough to the Pacific Ocean for the climate to be modified moderately marine influence. The section is mostly in MLRA 20 and partly in MLRA 19. Geomorphology. Narrow ranges and broad fault blocks; alluviated lowlands, and dissected westward sloping granitic uplands. Transverse and Peninsular Ranges geomorphic provinces. Lithology. Cenozoic marine and nonmarine sedimentary rocks and alluvial deposits, and Mesozoic granitic rocks. Soil Taxa. Alfisols, Aridisols, Entisols, Inceptisols and Mollisols in combination with thermic, mesic or frigid soil temperature regimes and xeric or aridic soil moisture regimes. Vegetation. Predominant potential natural communities includes Mixed chaparral shrublands, Chamise series, Canyon live oak series, Coast live oak series, Ponderosa pine series, Jeffrey pine series, White fir series and Lodgepole pine series. The following series are found throughout the section and are not restricted to or extensive in any subsection. Series dominated by exotic plants are not listed under subsections unless they are extensive and stable. Series dominated by exotic plants: Broom series, California annual grassland series, Cheatgrass series, Eucalyptus series, Giant reed series, Introduced perennial grassland series, Kentucky bluegrass series and Tamarisk series. Series that can occur in all subsections, but are not extensive: Bulrush series, Bulrush - cattail series, Cattail series, Duckweed series, Mexican elderberry series, Mosquito fern series, One-sided bluegrass series, Pondweeds with floating leaves series, Pondweeds with submerged leaves series, One-sided bluegrass series, Saltgrass series, Sedge series and Spikerush series. Series restricted to riparian settings: Arroyo willow series, California sycamore series, Fremont cottonwood series, Mixed willow series, Mulefat series, Narrowleaf willow series, Red willow series and White alder series. Fauna. Mammals include mule deer, pronghorn, bighorn sheep, coyote, bobcat, mountain lion, ground squirrel and kangaroo rat. Birds include hawks, eagles, owls, quail, mourning dove, mockingbird, jays, gulls, herons, crows, finches and sparrows. Species of concern include cactus wren, California gnatcatcher, Bell’s vireo, foothill and mountain yellow-legged frog, orange-throated whiptail and California mountain kingsnake. Elevation. 300 to 11,500 feet. Precipitation. 6 to 40 inches. Growing Season. 150 to 300 days. Surface Water Characteristics. Common rivers and streams, but most do not flow throughout the year. Rivers and streams flow in alluvial and weak bedrock channels westward to the Pacific Ocean, or eastward to basins in the Mojave Desert or Colorado Desert sections. Many reservoirs for municipal water supply and flood control occur below steep mountains throughout the section. Fire: Stand replacing fires of variable frequency, season and intensity. Seismic Activity: Seismically active area with strong shaking and ground rupture. Air Quality: Some plant and animal species show affects of air pollution. Steep Slopes: Movement of coarse soil particles by gravity (dry ravel) is a common process in steep mountainous portions of the area. Land Use. Composition and successional sequence of some communities has changed because of plant and animal species introduced between the mid 1800’s and early 1900’s related to urbanization, grazing, agriculture and recreational activities. Valley portions are densely populated. Cultural Ecology. Humans have been utilizing the area for some 10,000 years; the early San Dieguito Paleoindian hunting assemblage is well documented at sites along the San Dieguito River. After the end of the Pleistocene, prehistoric assemblages reflect extensive practice of seasonal rounds for resource gathering. Late in the 1700’s the Spanish established colonies and missions, and converted the economy of the entire area to ranching and farming; the later citrus industry became a major agricultural influence. Contemporary attitudes and beliefs are varied; lifestyle is urban. The international border and large Hispanic populations contribute to cultural diversity. The economy is varied and urban oriented; tourism and recreation are important industries. Subsections. 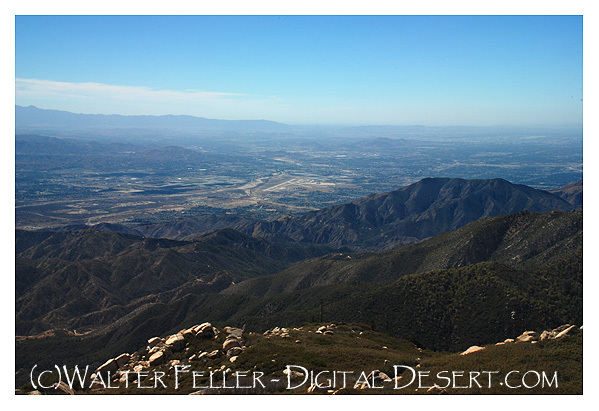 The Southern California Mountains and Valleys section is divided into 16 subsections. To obtain information about a particular subsection, click the subsection.